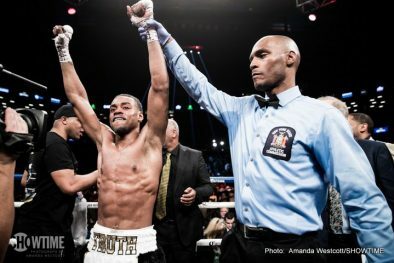 Undefeated welterweight world champion Errol Spence Jr. retained his IBF title with an impressive stoppage of former two-division champion Lamont Peterson in the main event of SHOWTIME CHAMPIONSHIP BOXING Saturday night from Barclays Center, the home of BROOKLYN BOXING®. 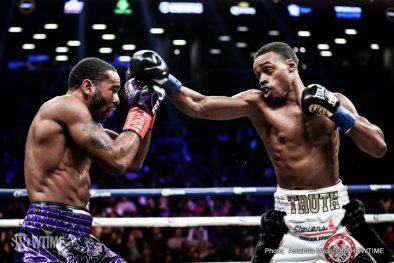 In his first defense since dethroning Kell Brook on SHOWTIME last May, Spence (23-0, 20 KOs) out boxed a tough Peterson (35-4-1, 17 KOs) from start to finish, showcasing a wide array of skills, speed and power. 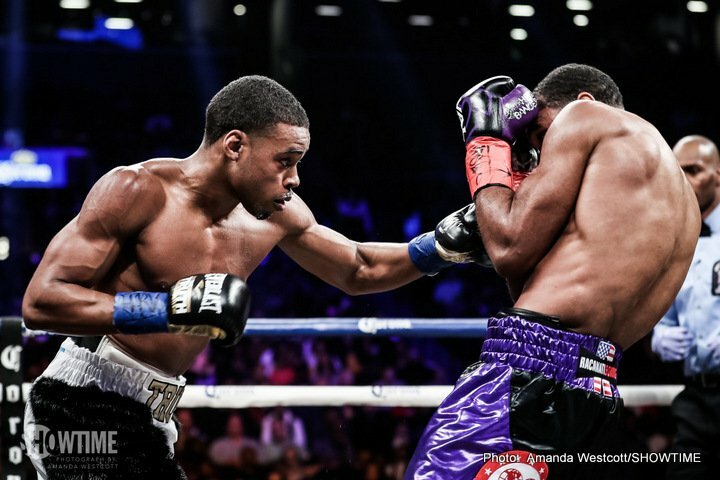 The fight was stopped prior to the start of the eighth round after Peterson’s trainer, Barry Hunter, called for the stoppage. 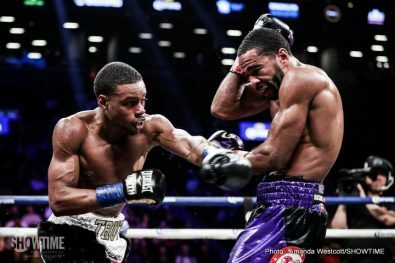 The fight played out similar to how both fighters predicted, starting in a cagey tactical affair before it turned into an aggressive fight in the middle rounds. 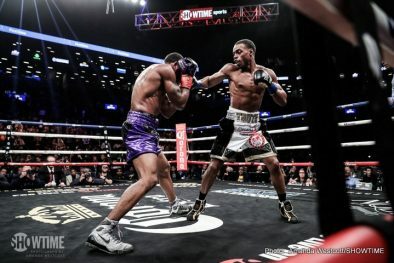 Two minutes into round five, Spence used a blistering left hook to send Peterson to the canvas (Click HERE for highlight). The Washington, D.C. native returned to his feet and continued to battle, but Spence proved to be too much. 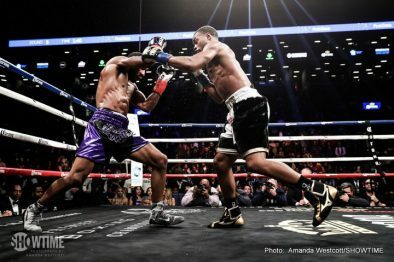 The 2012 U.S. Olympian out landed Peterson 161-45, while connecting on 49 percent of his power punches to just 31 percent for Peterson. 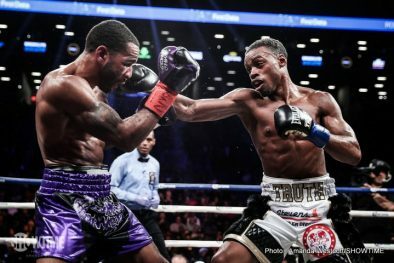 After the fight Spence spoke to SHOWTIME Sports reporter Jim Gray and was quick to give credit to his opponent. “I want to thank Lamont,” he said. “A lot of guys turned down the fight and he took it like a real warrior and I commend him for that. He’s a tough fighter. He’s willing to die in there.” Click HERE to watch the interview highlight. 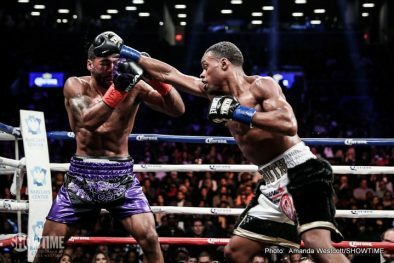 Despite earning the win in commanding fashion, Spence still believes he has room to improve. “I still can improve a lot on my defense,” said the unbeaten world champion. “I just have to keep perfecting my skills and keep progressing. 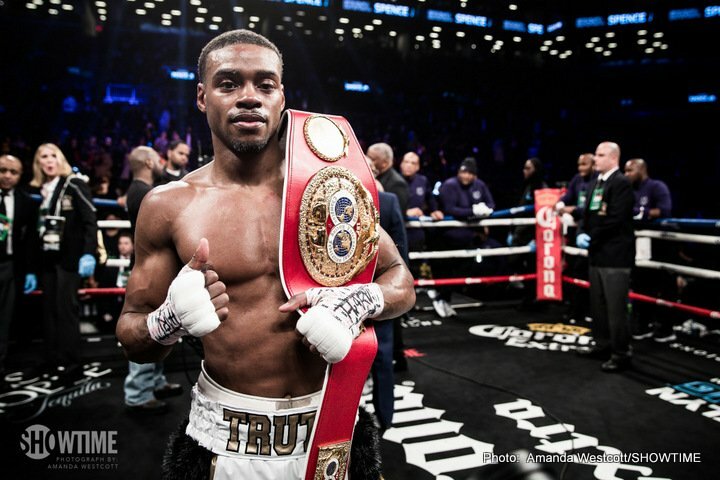 You’re going to see a better Errol Spence next time I get in the ring. 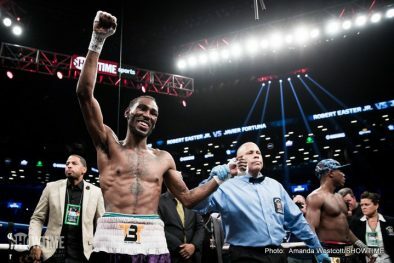 Undefeated 135-pound world champion Robert Easter (21-0, 14 KOs) earned a split decision victory over former world champion Javier Fortuna (33-2-1, 23 KOs) in the co-main event of the SHOWTIME telecast. The judges scored the bout 114-113, 113-114 and 115-112. 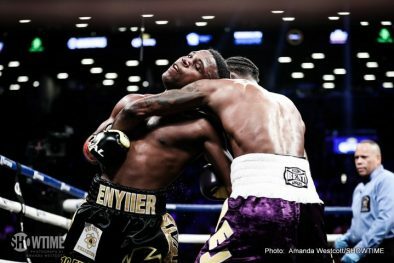 The back-and-forth bout saw two skilled fighters stay in the pocket and look to do damage from the inside. A second round point deduction from Fortuna proved costly when the Dominican was warned and then penalized for hitting Easter behind the head. Without the one point deduction, the fight would have been scored a draw. 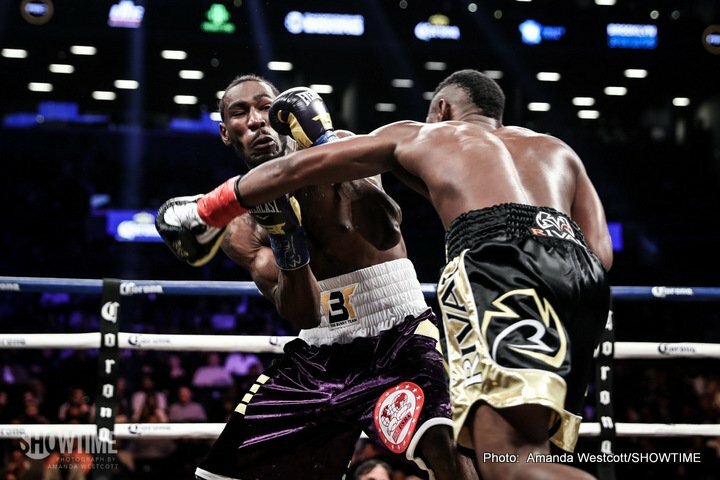 While Easter Jr. was slightly busier, Fortuna landed the more powerful punches. 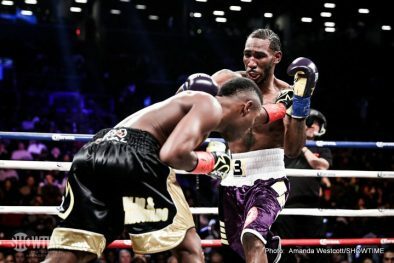 Easter Jr., who held a significant height advantage, out landed Fortuna, connecting on 120 of 383 (31 percent) power punches while Fortuna connected on 113 of 441 (26 percent). 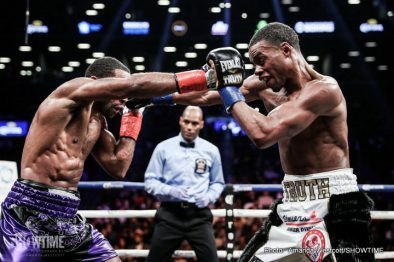 “It was a tough fight, he’s a former world champion for a reason,” Easter told Gray. “We made it tough trying to counter punch. He wasn’t throwing much and it made it difficult for me to chase this guy around. A disgruntled Fortuna also spoke to Gray, “the public knows what happened here. They booed because they know that I won this fight. 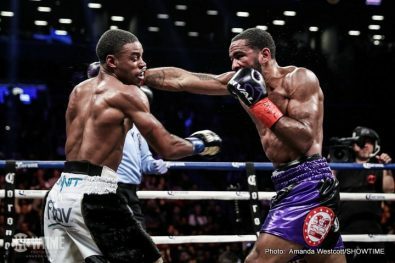 Unbeaten light heavyweight contender Marcus Browne (21-0, 16 KOs) made quick work of Francy Ntetu (17-2, 4 KOs) in SHOWTIME CHAMPIONSHIP BOXING PRELIMS action, as he dropped and battered his opponent early to force referee Arthur Mercante to stop the bout at just 2:15 of the first round. 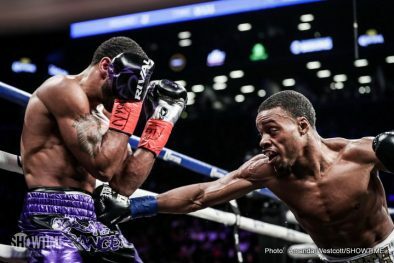 Fighting for his 12th time at the Barclays Center, the 27 year-old Staten Island native kept his unblemished record intact by utilizing his powerful left hand on the overmatched Ntetu. Browne established his dominance from the start, landing a clean overhand left that dropped Ntetu halfway through the round. 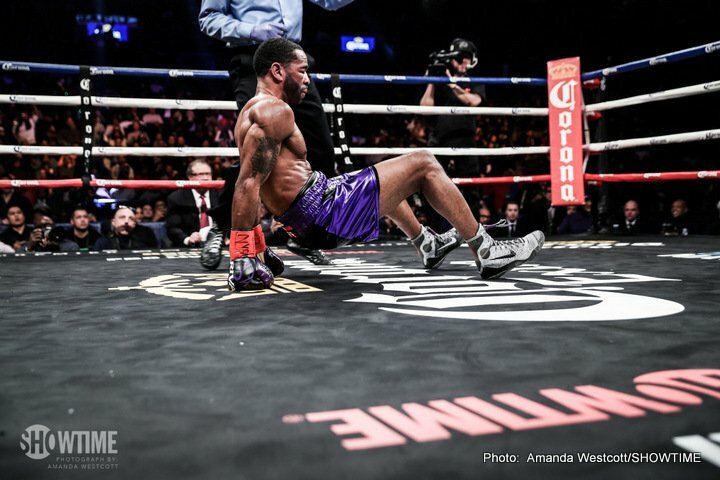 The Montreal, Québec native was never able to regain his feet and found himself cornered against the ropes just thirty seconds later. A barrage of powerful combinations landed on the defenseless Ntetu left the referee with little option but to stop the fight with 45 seconds remaining in round number one. “We worked for this win. He walked into a sure shot and I made him pay,” said Browne. “The overhand left caught him and that was the beginning of the end for him. I knew he was hurt. Ntetu, who moved up to the light heavyweight division for this fight, had a hard time dealing with Browne’s combination of speed and power on his way to the second loss of his pro career. 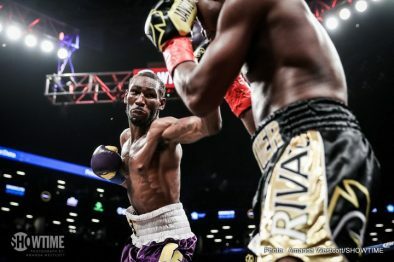 “[Browne] is very explosive, congrats to him,” said Ntetu. “He’s fast, he’s smart and I did not expect him to be that explosive. He got me with his right hook and a straight left. In the opening bout of the SHOWTIME CHAMPIONSHIP BOXING PRELIMS, undefeated Adam Kownacki (17-0, 14 KOs) delivered a brutal knockout of Iago Kiladze (26-2, 18 KOs) at 2:08 of the sixth round of their heavyweight matchup. Kownacki, born in Lomza, Poland but fighting out of Brooklyn, New York, enjoyed the support of his hometown crowd as he steadily wore Kiladze down. Kownacki was the more aggressive and accurate of the two fighters, landing 43 percent of his power punches and 35 percent of his total punches, compared to just 30 percent and 18 percent, respectively, for Kiladze. Despite a bloody nose that Kownacki suffered in the first round, the Polish heavyweight began to pour it on and tire Kiladze with a series of uppercuts and one-two combinations in the fourth round. The action-packed bout came to an end when Kownacki connected on a combination of two uppercuts and a right hand that sent Kiladze on his back in the final minute of the sixth round. 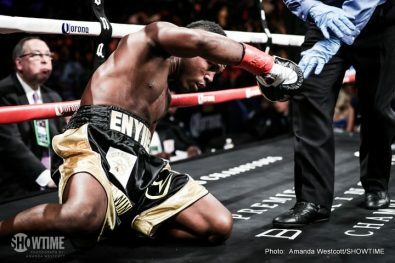 After a stunned Kiladze returned to his feet, referee Shada Murdaugh called the fight at the suggestion of the ringside doctor. “I’m so thankful to all my Polish fans who come out and give me that extra support”, said Kownacki, who fought in front of hundreds of his compatriots. “I’m going to keep fighting for the fans and give everyone a great show. Saturday’s telecast will replay on Sunday, January 21 at 9 a.m. ET/PT on SHOWTIME and Monday, January 22 at 10 p.m. ET/PT on SHOWTIME EXTREME and will be available on SHOWTIME ON DEMAND® and SHOWTIME ANYTIME®.